Tension set rings, sometimes known as 'floating diamonds', are so unique in their style as they appear to be magically suspended in their ring settings. Tension set diamond rings made by Novori are known for their stunning beauty and these rings have been a favorite among Novori customers. You should know that these unique and beautiful rings can also be made with matching wedding bands so you can have a complete engagement ring with a matching wedding band as a matching set. Just look at how nicely the two rings fit together to make a complete set. The beauty of the tension set ring is still visible and the wedding band just compliments the diamond engagement ring. 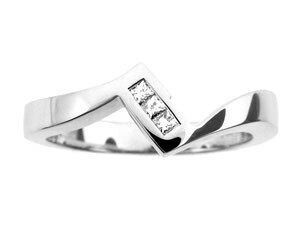 And there is not need to worry, the tension mounting still has the same characteristics to keep your diamond safe. 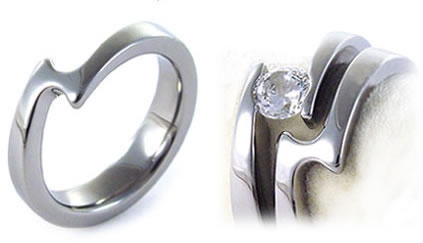 The image to the right show the wedding band and the unique shape that allows the wedding band to fit nicely beside and into the tension set engagement ring. Although it may look somewhat different from a normal ring on it's own, put next to the engagement ring they make a perfect pair. There are many styles and designs of tension rings and each one will have a wedding band that can fit nicely with the engagement ring. Just look at this example on the left. 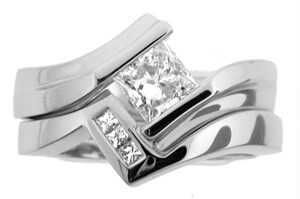 It has a dual metal bezel set diamond engagement ring with a matching wedding band featuring pave set side diamonds. It is unique but spectacular to look at. Since the diamond engagement rings and tension set rings and wedding bands are custom made at Novori, we can have any number of diamonds in the band to suite your taste and budget. In order to match an existing diamond tension ring perfectyly we request that you send us your engagement ring so that an exact match can be made. Just call us and let us know how you want it made. We will be glad to assist you. Here is a simpler, cleaner design that is very popular. Even though tension set rings have a unique history and have been around for over 40 years the uniqueness of the designs are magical. The image shows you just how the wedding band fits perfectly with the engagement ring to create a matching tension set ring you will love to wear. Although the appearance of a tension set ring makes one question the safety of the ring, it is very safe. Just consider the manufacturing process. The diamond is mounted in a high pressure mounting, making tension set diamonds and gemstones secure and safe, or even safer than, a typical four-prong setting when properly made. When purchasing a tension set ring, ensure that the manufacturer uses the proper metallurgy techniques as this is a skill only a few craftsmen have mastered. Be careful of fake tension rings often found on internet auction sites that can be pulled apart by hand. Genuine tension set rings cannot be pulled apart by hand and our tension set rings are guaranteed authentic. 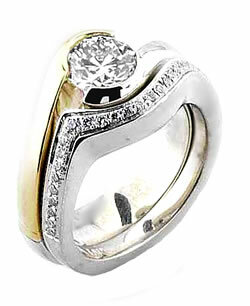 The unique way that a tension set ring supports the diamond allows for more light to enter the diamond than other ring settings. This means that there will be a greater brilliance or fire coming from the diamond. It has been said that a tension set ring can enhance the color appearance of your diamond by as much as two color grades. This brilliance in the diamond and unique look of a 'floating diamond' make tension set rings irresistible.